MANGO SMOOTHIE (Dan Trimmer) Tetraploid (Across The Galaxy x Patsy Cline) 26" E. Re. Ev. 5 1/2" (Sdlg. 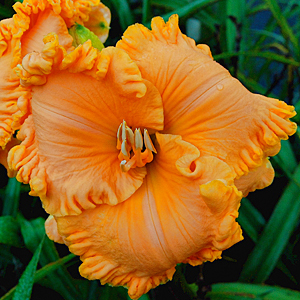 8-35) This grand bold "nasturtium orange" to my eye is a larger more colorful Patsy Cline. Nicely budded with a count of 18, easily pod fertile and pretty beyond picture Mango Smoothie was bred with heavily last summer.